Størrelse af denne forhåndsvisning: 800 × 600 pixels. Andre opløsninger: 320 × 240 pixels | 640 × 480 pixels | 1.024 × 768 pixels | 1.280 × 960 pixels | 3.072 × 2.304 pixels. 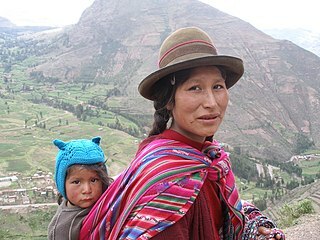 English: An Amerindian woman and child in the Sacred Valley, Andes, Peru. This image was originally posted to Flickr by quinet at https://www.flickr.com/photos/91994044@N00/93022902. It was reviewed on 15. juli 2007 by FlickreviewR and was confirmed to be licensed under the terms of the cc-by-2.0.